There are some key decisions to make when selecting a bed, like choosing between a box spring or base and mattress. Whether you're looking at a contemporary, country or traditional bed, our buying guide will help make your choice easier. Slat Base or Flat Base: Slat base beds are bed frames with wooden slats that span from side to side in order to support the weight of the mattress. Extra storage room under the bed. Come in a wide variety of styles to achieve almost any look. Solid slats are regular flat slats. Posture slats are 'sprung' for extra support, which extends the life of a mattress. Box Spring: A mattress with a matched internally-sprung bed base. A supportive box spring or flat base can extend the life of a mattress, compared with a solid-slat base. 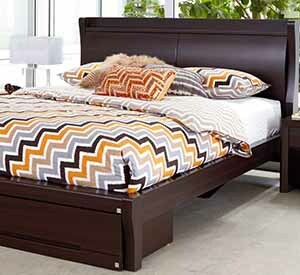 Timber-finish beds are low maintenance. Beds with tall footboards look great in large rooms with high ceilings, but lower footboards usually suit smaller spaces. Large, bold headboards make a dramatic statement in style, especially if upholstered in luxurious fabrics that set off the colours of your room's décor. It's important to measure the available space where the bed will go. Rather than simply going off the size of the room, take into account the space taken up by other furniture. There should be at least a metre of space around the bed at any given point to ensure you can walk around freely. Ideally, your bed should be 10 to 15cm longer than the tallest person sleeping on it. Low footboards are often best for taller people, as there is more room to move. If your bed is for a couple, then it should accommodate the two adults comfortably. While many of the latest bedroom styles support lower beds, it's important to make sure that you're comfortable getting in and out of the bed. You could be rising from the same bed for the next decade, so it makes no sense to buy an extremely low bed if you have an existing knee or back problem. Box springs are generally higher than base and mattress combinations. Regardless of whether you decide to go with an box spring or a base and mattress combination, the most important thing you should look for is support. This means that pressure points, like your hips and shoulders, should be protected from taking too much load. There should be no sagging in the mattress. The mattress should be equally firm at all points. The mattress shouldn't leave any large gaps when fitting around your body, no matter your sleeping position. Pillow top mattresses offer an extra padded layer on the surface of the mattress for a more soft and luxurious feel, without compromising on support levels. You should always test the support of a bed before you buy it. This means jumping on and getting comfortable. Lie down in the position you sleep in and test out the firmness. Is it big enough? Make sure you test it with your partner. Roll around; your partner shouldn't be affected by your movement in the night. A good quality box spring or flat base should last up to 10 years, as should a quality mattress when placed on a quality base. Posture slats offer more support to the mattress, extending its life. When choosing a bed base, it's important to look for quality craftsmanship. The bed should feel solid, so try to rock it. If there's a lot of play, the bed won't last long. Look for attention to detail in the joints; they should be flush and tight. Proper bed maintenance is simple, but can dramatically extend its life. Keep your mattress dry and clean with a quality mattress protector. This will keep bed mites and other undesirables at bay. Spot clean any spills immediately using detergent. Ensure you dry the mattress fully in the shade before using it again. Tighten the legs on an box spring every six months. For new sets, tighten after the first six weeks. Tighten the bolts on a bed frame every six months to avoid the bed becoming loose and squeaky. Rotate the mattress every few months. Wipe down timber facings with a damp cloth regularly to remove dust and to keep the timber looking good. Furniture polish is not recommended.